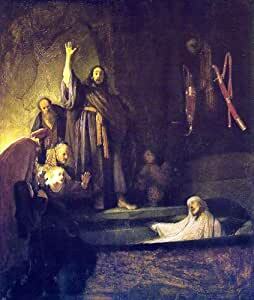 20.1″ x 25.1″ Rembrandt Van Rijn The Raising of Lazarus premium canvas print reproduced to meet museum quality standards. Our museum quality canvas prints are produced using high-precision print technology for a more accurate reproduction printed on high quality canvas with fade-resistant, archival inks. Our progressive business model allows us to offer works of art to you at the best wholesale pricing, significantly less than art gallery prices, affordable to all. This artwork is gallery wrapped by one of our expert framers, wrapped with 1.1″ deep heavy duty wooden stretcher bars, to hang frameless for a high-end designer look. The printed image is wrapped around the edges and visible on all four sides. Our gallery wrapped canvas print comes with hardware, ready to hang on your wall. We present a comprehensive collection of exceptional canvas art reproductions by Rembrandt Van Rijn.